What an amazing month June has been. These longer days certainly seem to give everyone more energy. We’ve had so much going on, so many people putting on wonderful events and, is if that wasn’t enough, so much sunshine! We had a fantastic night on Friday 13 June at Hennessey’s and thank you so much to everyone who helped make it such a success, particularly Emily and Louise Sims and Mr Savo himself. We had a lovely evening – check out the great photo album we have from the event on our Facebook page. All courtesy of Dougie Worthington from Peacock Dreams photography. There’s no doubt that this year’s event was the best yet. Huge thanks go to David Hanbury and his team, Martyn Strange and our fantastic press officer Nicky Allen, Boyce Hatton, Babbacombe Garage, the Babbacombe Inn, Riviera Mortgages, the Rotary Club of Babbacombe and St Marychurch, Child Friendly Matters, Angels Tea Rooms and the Buccaneer Inn, along with our amazing selection of volunteers who all make this event run so smoothly and so successfully. We must also thank everyone else who donated prizes for our 2014 Grand Raffle and auction including Cavendish Hotel London, First Great Western, Shearings, Hanbury’s Famous Fish & Chips, Babbacombe Theatre, South Devon Steam Railway, With a Difference Entertainment, Babbacombe Bay Hotel, Seaway Autos, Babbacombe Tesco, Tiger Bills, Keith’s Diner, Georgie Mays, Kents Cavern, Red House Hotel, Torquay United FC, Dotty Heaven, Seaton Tramway, Becky Bettesworth, Stagecoach, Babbacombe Cliff Railway, Imperial Hotel, House of Marbles, Beyond Beauty, Agatha Christie Heritage Bus and River Dart Adventures. This is always a huge team effort and we thank all of our volunteers and everyone who supplied us and helped make the day the success that it was. Particular mention must go to ur fundraising manager Brilliant Brian Lewis for co-ordinating so much connected with this event and to the lovely Anais Hay who organised the incredible line-up of bands and gave us a day of fabulous live music. Who’s met our magnificent mascot – Memory Maker Man? Resplendent in blue and yellow Lycra (we’re not kidding!) he’s our hero and will be out and about at all of our events. You can’t miss him – no, seriously, you can’t. If you do see him, make sure you take a pic or two and post it up on our Facebook page. International fame is just around the corner…. Right – forget Glastonbury. First it was Hanbury’s Music Festival, now it’s Wigfest, from 1 to 3 August. Three days of fantastic live music at Duckaller Farm in Dawlish. There’s lots of entertainment, bar, all children under 16 can attend for free (with an adult). Headliners include The Fabulous Beaver Brothers and The Electric Swing Circus. Tickets are just £15 for a day or £30 for all weekend. Tickets are available from Keith on 07887 687265 or Jamie on 07515 893874. 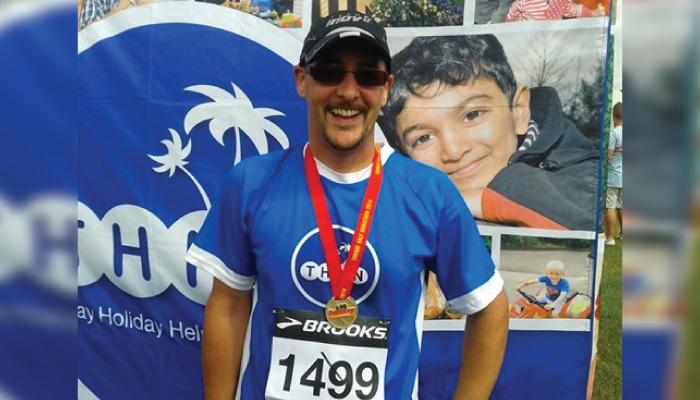 Mountain Warehouse is running a Charity Challenge and Luke has entered the competition. To enter you have to have participated in an outdoor challenge to raise money for charity. As you all know, Luke’s done his fair share of those. However, his 100 mile Thames Path Run is the one we’re focussing on here. All you have to to is vote and whoever wins the public vote wins £5000 – what a fantastic boost to THHN funds that would be. So, if you have a spare couple of minutes please visit Luke’s entry on the Mountain Warehouse Charity Challenge page at www.mountainwarehouse.com and vote for him to win. You have until 12 September for the first phase of voting. What an amazing Sunday we’ve just had on Paignton Green at the Torbay Half Marathon – thanks so much to the organisers for making us part of this wonderful event. So many people took part in both the Half Marathon and the Fun Run, we had a sea of blue Memory Maker t-shirts running everywhere! A huge and heartfelt thank you to all of our amazing Team THHN runners, big and little! We do, of course, have lots of people to thank, including the wonderful Pennywell Farm who sponsored the children’s fun run team who turned out to be a bit of a star attraction. Each of our runners was given a goody bag after the event, with all sorts of treats donated by Pennywell Farm, Teddy Mountain, Riverford Home Delivery South Hams, Heron Valley, Claire’s Cakes, Burts Crisps, Torbay Road Spar, Barnabus Football Academy, Angels Tea Rooms,The Boulder Bunker and Cup Cake Café. As always, we must also thank our volunteers without whom we wouldn’t be able to play such a part at these events and last, but by no means last, our marvellous Memory Maker Man! The Memory Maker Caravan, who hosted families referred by the Plymouth CLIC Sargent team and the Rainbow Trust Children’s Charity. Our wonderful suppliers including: Torbay Family Butchers, Teddy’s Cakes, The Happy Apple, Halletts the Bakers, Claire’s Cakes, Riverford Home Delivery South Hams, Save on Meats and Total Produce Devon. Collaton St Mary C of E Primary School who invited Luke along to one of their assemblies to tell the children all about the THHN. They also held a sponsored fitness day this month which raised a huge £560 for us. Babbacombe All Saints Primary School who held a fashion show for us this month. Michael Hill from Angels Tea Rooms who installed an automatic watering system over at our Memory Maker Caravan. Abigail’s Pantry in Babbacombe, The Royal Carvery in Babbacombe and Hands on Healer, Janet Courtenay, who all became THHN Business Supporters this month. Dougie Worthington, our wonderful photographer from Peacock Dreams, who gives up so much of his time to take great photos at lots of our events. Hotel De La Mer who welcomed a family from the Childhood Eye Cancer Trust. St Marychurch Rent Agency who are sponsoring the THHN team at this year’s Pedal Car Grand Prix on 20 July – don’t forget to come along and support us. The event takes place on Torre Abbey Meadow in Torquay and the race starts at 2pm. All of our incredible Team THHN runners, who have been rasing incredible funds and training very hard! Especially Mark the machine Stockman who entered the Endure 24 event for us (24hr running event). Of course our amazing volunteers who keep the cogs of THHN turning so very well!